Cost: $50.00 if you pre-pay by July 12th. $55.00 at the door. This presentation will explore how to optimize life-long flexibility, health, and vitality of the hips and pelvis, including the sacrum, SI joint, pelvic floor and pelvic organs. The morning will begin with a fascinating lecture by Dr. Kim Tripp on the anatomy and osteopathic treatment of this region of the body and will include a relevant exercise. The second half of the program will be a targeted yoga session for pelvic health presented by Ms. Hernandez. Dr. Tripp is in private practice with Dr. Goldman at Goldman/Tripp Osteopathic Healthcare in Sharon. Dr. Tripp is a traditional Osteopathic physician and Osteopathic manual medicine specialist. Osteopathic medicine is practiced by fully licensed physicians in the U.S. with a D.O. degree – a Doctor of Osteopathic medicine degree. The practice of Osteopathic manual medicine treatment is based on the essential relationship in all living things between structure and function, in other words, the natural interdependence between anatomy and physiology or the physics of the body and its chemistry. Traditional Osteopathic physicians such as Dr. Tripp and Dr. Goldman use comprehensive and precisely detailed knowledge of anatomy and physiology to promote health and healing in their patients. They work gently with their hands to help your body restore optimal function based on optimal structure. Their medical specialty is therefore called Osteopathic manual medicine. They receive uniquely in-depth training in anatomy and physiology and their relationship within your body in the context of a full physician’s medical training. Their practice has been especially effective for, but not limited to, musculoskeletal and other structural issues, as well as chronic pelvic pain, headache, gastrointestinal problems, post-concussion syndrome, sleep disturbance, allergies, and many other health issues. After an extensive career dedicated to plants and botanical gardens, Dr. Tripp is now a fully licensed osteopathic physician in traditional osteopathic practice at Goldman/Tripp Osteopathic Healthcare in Sharon, CT. She remains an active student of the natural world, gardener and plant advocate, and serves as botanical expert member of the Conservation Advisory Council of her town in Ancram, NY. Dr. Tripp received her B.S. and M.S. from Cornell University, and her Ph.D. in plant sciences from North Carolina State University – where she also served as Curator for the J.C. Raulston Arboretum. She completed her post-doctoral work in plant science at the Arnold Arboretum of Harvard University, then served as Director of the Botanic Garden of Smith College, and then as Director of the New York Botanical Garden. After a series of inspiring experiences, Dr. Tripp pursued a second career as an osteopathic physician receiving her D.O. degree from the University of New England College of Osteopathic Medicine with awards and recognition for excellence in osteopathic medicine. Post-graduate osteopathic medical education followed at Berkshire Medical Center, Pittsfield, MA, and St. Barnabas Hospital, Bronx, NY. Dr. Tripp has always been dedicated to the study of nature, especially through the study of plants. Dr. Tripp’s work includes plant conservation, sustainable use and climate change, restoration of rare and endangered plants, growth and development of trees in managed environments, and evaluation and distribution of plants of promise. She has studied and collected plants in diverse habitats throughout North America (including Mexico), in South America (Chile), Europe, Japan, and China. She has extensive experience in planning, planting, and management of diverse landscapes, gardens, and forest environments. Her work has included historic landmark sites and gardens, urban spaces, forest restoration, and the development, management and interpretation to the public of plant collections in botanical gardens. Dr. Tripp has taught and lectured on a broad range of botanical, horticultural, and osteopathic subjects. Dr. Tripp is dedicated to sharing her training in osteopathic medicine through teaching – to which she brings an unusual perspective combining her expertise in the natural world with osteopathic medicine. She is an active member of and teaching faculty for A Still Sutherland Study Group, teaches OMM for the hospital patient to OMS III students at Sharon Hospital, and offers the Sacred Nature of Osteopathy course that she developed and teaches with Andrew Goldman, DO. Dr. Tripp has published widely in public and professional scientific journals, is the co-author of three books, and is currently the host of an NPR wellness radio show. 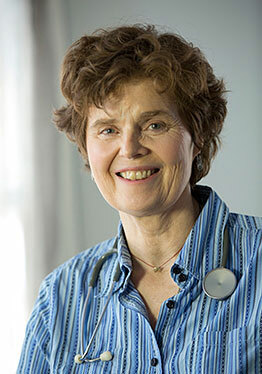 Dr. Tripp brings her love for and expertise in the study of nature, and her dedication to health and wellness for all, to the practice of traditional osteopathy at Goldman/Tripp Osteopathic Healthcare in Sharon, CT, (www.GoldmanTripp.net).